CARE Nepal is an international humanitarian organization working in the country for the past 37 years. It currently works in 36 districts through various programs on issues relating to improving the lives of the poorest and most vulnerable populations through care programs that work on the following themes: food security and climate change; emergency preparedness and DRR; migration and urbanization; sexual reproductive and maternal health; gender based violence; women and girls' leadership. 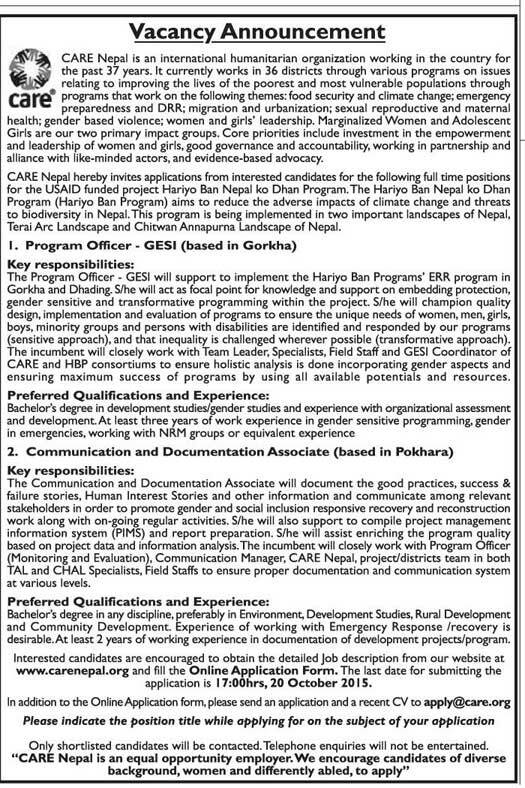 CARE Nepal invites applications from interested candidates for the following full time positions for the USAID funded project Hariyo Ban Nepal ko Dhan Program.